Fill in the field with a name you want and click the [Add New Sidebar] button. By the same way you can create all sidebars you need. Clicking the cross icon removes the chosen sidebar. Once you are done, don't forget to save your changes. 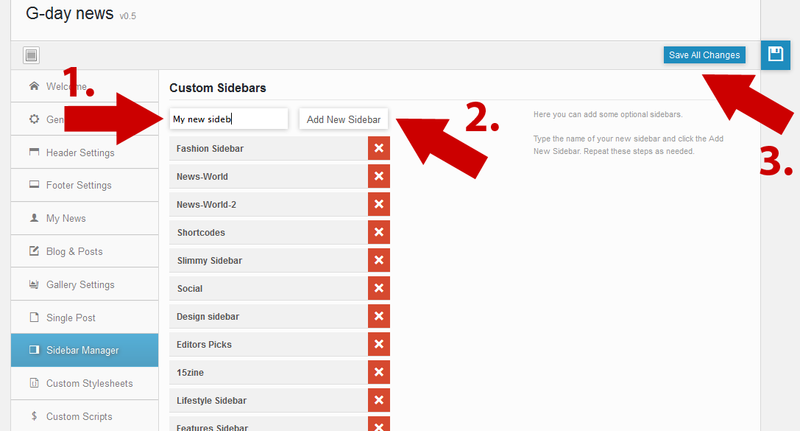 Notice that you find the created sidebars in the Widgets settings and can assign some widgets to them. There are several heading styles for your custom sidebars. Select the one you prefer. If you leave [Default] option, the style you have se in Theme Options > General Settings > Global Heading Style will be used. If turned On, then when user scrolls down the page, the sidebar will be sticked to the bottom of a browser window after achieving the end of the sidebar content. To not to fix the sidebar, turn the option Off. If turned On, then when user scrolls down the page, the inline sidebar will be sticked to the bottom of a browser window after achieving the end of the sidebar content. To not to fix the inline sidebar, turn the option Off. Bear in mind that this option can be found within the edit modal window of a page when you edit element called Inline Sidebar via Revo Composer.